“Right now I am learning French with ‘study sessions’ (I sit down, I study French), but then outside of that I’m not really ‘using’ French in my life – so I was wondering if there were things you would recommend for making it more a part of my life, even when I am not studying”. Some of my students see the world around them with French in mind: whether they are driving, walking in the street or reading the menu at the restaurant, they often wonder how their own thoughts, any written signs or expressions they hear would translate into French. That gives them much food for thought! When they are unsure about something, they just ask me on our next lesson. Easier level: you can try to spell in French, as fast as possible, any word or phone number you see. You can also try to name in French what you see around you. More advanced level: why not start asking yourself: “How would I say that in French?” Imagine fictional conversations or arguments, questions you could ask, etc. Anything really! 2. Meet people and speak French with them ! Join a French conversation group in your city (meetup.com) to mingle and practice with other members around your level. If there is no French group where you live, it’s easy to launch one. A slightly more expensive option consists in travelling to a French-speaking country! Get a cooking book in French or check Marmiton website to choose between over 60,000 recipes. Reading the ingredients and instructions in French are a fun exercise…and the end result will let you know whether you got everything right…or not! Try to write your shopping list in French! Next time you go to a French restaurant and your waiter is French, force yourself to order in French, they will appreciate! Expose your ear to French accents and rhythm while commuting, shopping or at the gym. You don’t need to understand everything! Train your ear, pay attention to the rhythm. Can you pick any word that you know? Can you understand what the topic is? 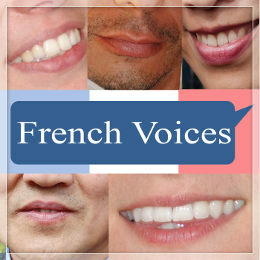 I host French Voices (frenchvoicespodcast.com), in which I interview passionate native speakers of French who share the story of their profession, lifestyle, etc. Each interview comes with the transcript as well as questions to test your comprehension. LesRadios.fr : link towards the main French radio stations (sorted in three groups : music, general, news). Listen live! Check out my online course “How to Sound like a Native French Speaker: everything you need to know about French pronunciation, intonation and rhythm”. Sing in French! Enter the title of the French song you want to listen to on Youtube along with the word “paroles” / ”lyrics”. Sing along, this is excellent to work on your pronunciation ! On your smartphone or tablet: set language to French, press the microphone icon in the email or SMS keyboard and dictate an email/SMS using the voice recognition only! Check whether what you meant to say is what came up on the screen. Fun guaranteed! On your iPhone, set Siri to French and ask questions or talk to Siri in French. It is the same concept as above, with the added benefit that you can actually ask for really useful information! If you don’t know where to start, read my article “Improve your French pronunciation: ask Siri!” and use the PDF worksheet. Visit AlloCine website to watch movie trailers -and read the reviews– in French. Start by watching movies in English with French subtitles (not the other way round!). When you start to know the movie wellAs you improve or get to know the movie, you can put the audio in French as well. You can find full movies, tv shows, cartoons, theatre plays etc on Youtube…or at your local video store! French books for native speakers can be accessible from upper beginner level of French: start with comics, children books, travel guides, magazine articles. For more advanced levels, try novels and newspapers (French media: try Le Monde or Courrier International). For suggestions on where to start with reading French books and where to find these books, read my article here. Also, check out my Recommended Reading list. There are books in French designed for foreign learners, with various levels of difficulty. Some of these books come with a CD: French audiobooks are a good way to start. The books may also include activities such as questions, grammar and vocab exercises and cultural pages. Defy Akinator, le Genie du Web: Think about someone (famous or not) or something and the Genie will guess who/what it is! Great to practice your French reading skills. Beware, this game is very addictive as you’ll most likely want to play over and over again to try to trick Akinator! Read the French sections on any packages, labels, lists of ingredients, user’s manuals, etc. Whatever you can put your hand on! Surf and read the internet in French! A popular French web browser (=moteur de recherche) is yahoo.fr . Read/browse the home page, and surf from there, clicking on what appeals to you the most. Read French blogs to learn French words/expressions. French Word-A-Day (Serving you a daily thrice-weekly slice of French life) has posts written in English but an interesting hindsight of French lifestyle. The blog also contains references and useful expressions in French. The author, Kristin Espinasse, has published two books : Blossoming in Provence and Words in a French Life: Lessons in Love and Language from the South of France. News in Slow French is a great concept for upper beginners and intermediate students. The name says it all: you can listen to the news at a slow speed. It also comes with the transcription of the audio. Little content is accessible for free – full access requires a subscription. Watch the French news (In Melbourne, it is daily at 10.20am on SBS Two). For advanced students of French. Check the French public television network : these 6 French TV channels provide quality programs. Watch the news (called “13h” / “20h” on France 2) and many programs such as home and gardening, home, series, art, politics, cooking/food, entertainment/games, parenting, sports, current affairs, documentaries, etc. And you, how do you add French into your life? Share your tips in the comment section!